BERLIN: The husband of Asia Bibi at the centre of a divisive blasphemy case on Saturday criticised a government deal with protesters that left her in legal limbo, and called on authorities to protect her. 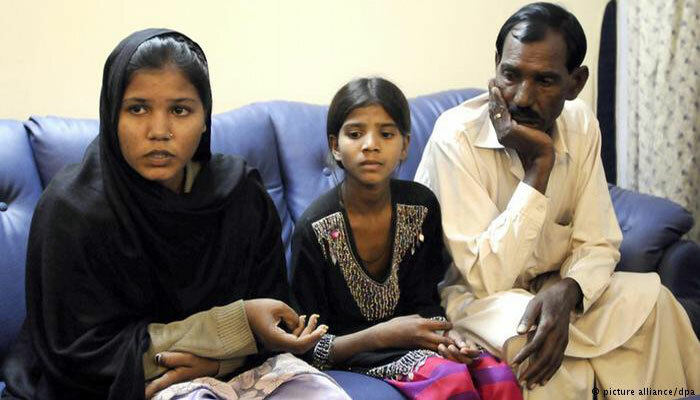 Asia Bibi, on death row since 2010 on blasphemy charges, was acquitted by the Supreme Court Wednesday and ordered set free, triggering protests by Tehreek-e-Labbaik Pakistan (TLP), who paralysed Pakistan for three days. The government reached a deal Friday to end the protests by agreeing to a travel ban preventing Bibi from leaving the country, and saying it would not object to TLP appealing the verdict. An appeal has been filed with the Supreme Court. "It is wrong to set a precedent in which you pile pressure onto the judiciary," Bibi´s husband Ashiq Masih told German Deutsche Welle radio. He said the government should never have yielded to pressure from protesters. Masih said the court had been "very courageous" to acquit his wife, an illiterate mother in her 50s whose case started in 2009 while she was working in the fields. "The current situation is very dangerous for us. We have no security and are hiding here and there, frequently changing our location," Masih said. Bibi´s lawyer fled Pakistan on Saturday, fearing for his life. Masih demanded the government reinforce Bibi´s protection in prison, worrying that she may be attacked. He cited the case of two Christian men who were shot dead after a court acquitted them in another blasphemy case. "The situation is dangerous for Asia. I feel that her life is not secure," he said. "So I appeal to government to enhance Asia´s security in jail".